Behavior modification assumes that observable and measurable behaviors are good targets for change. All behavior follows a set of consistent rules. Methods can be developed for defining, observing, and measuring behaviors, as well as designing effective interventions. Behavior modification techniques never fail. Rather, they are either applied inefficiently or inconsistently, which leads to less than desired change. All behavior is maintained, changed, or shaped by the consequences of that behavior. Although there are certain limits, such as temperamental or emotional influences related to ADHD or depression, all children function more effectively under the right set of consequences. Reinforcers are consequences that strengthen behavior. Punishments are consequences that weaken behavior. My pastor, Heather, worked this concept into a sermon last Sunday. She questioned the old school practice of frequently suspending offending students, essentially telling the student that because they don’t conform they aren’t wanted. Eventually this point sinks in and guess what? The student soon no longer wants to be in a place where they aren’t wanted. Suspension is no longer a punishment but a welcome reward. She used this analogy to point out that this is often how Christians approach the faith, they may feel unworthy of God’s love or may even make others feel this way. It wasn’t long before her sermon began to impact the way in which I look at things. Case in point; on John Shore’s blog there has been a lively conversation going on about (surprise!) 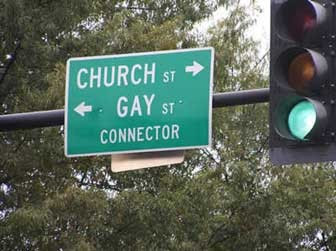 homosexuality and the Church. Predictably, the discussion tended to center on whether or not homosexuality was a sin or if it was a sin could it in some way be excused or was it even a sin deserving of any more mention than the sins that afflict all Christians. Inevitably someone will say that it is our Christian duty to call out sin wherever and whenever we see it. But what is our ultimate goal here? For instance, in the classroom we do not use behavior intervention techniques to make individual students look and act more like ourselves. We are not interested in a change in their behavior just because we disapprove of them. The ultimate goal is for students to learn, as well as to have them help maintain an environment where other students can also learn . If our goal, as Christians, is to spread the Good News (which hopefully will result in people coming closer to God) how is this accomplished by ‘confronting’ individual sin? Shouldn’t we be interested in lifting up those positive “Christian” characteristics that a person possesses, no matter how few they might be? Telling people that because of their ‘sins’ (especially if those ‘sins’ are not anti-social in nature) they are ineligible for membership in our community is selfishly aimed at satisfying the ‘supposed needs’ of the community and not the spiritual needs of others. ‘Supposed needs’, because no community ultimately benefits from a lack of diversity. So, rather than focusing on what we see as the negative (yet non-threatening) behavior of those who might be seeking a closer relationship with God, let’s try and focus instead on their other, positive, qualities. What is more important to us as Christians; our behavior or our relationships? Not that behavior is unimportant, but at what expense comes our attempts to change certain behaviors in others? Who knows? Perhaps the ‘righteous’ may learn a thing or two from communing with these ‘sinners’. Besides, if we all had to clean up our acts first then not one church pew would be occupied. This entry was posted on May 20, 2009, 3:40 pm and is filed under Christianity, Church, Evangelism, Faith, God, Gospel, Homosexuality, Religion, Sin, tolerance. You can follow any responses to this entry through RSS 2.0. You can leave a response, or trackback from your own site. Ah, but so many confuse spiritual dedication to religious legalism. God has proclaimed so much more than drunkeness and sexual immorality as sin. And I suggest that this is mostly what it has become. Like minded people coming together and intent on surrounding themselves with very similar people. Perhaps there are not professing homosexuals in a certain congregation, because that is one of the sins that have been emphatically called out from the pulpit. But how many are sitting in the pews who continue to conduct ‘business as usual’ even though their business practices may fall into one of the other sins God mentions? Or how many break on a regular basis, with no sense of guilt, that commandment that Jesus said summed every other commandment up? How many ‘spiritually dedicated’ Christian live by mantras like; “Let the buyer beware” -“God helps those who help themselves” -“The early bird gets the worm” – “To the victor go the spoils” etc etc. Something about this very acceptable mindset is antithetical to the Gospel. In fact, in essence, it is institutionalized sin. My concern is not so much with the homosexual Christian – they have to make peace with God – but with the rest of us who so easily see that speck in their eyes but are blind to our own rationalized trespasses. Jesus warns us about this. Well, believe it or not, there are many aspects here with which I agree. There are those who see their “salvation” as an excuse to condemn others. Although, one might suggest that if by their fruit they are to be known, that their so-called ‘salvation’ is in question. I think where we differ is in our perceptions of what the solution is/should be. I agree that when you put ritual and dogma ahead of a true and genuine understanding of the scriptures you are a broken church. I propose that those churches are faililng not becaues they are too focused on the Bible, but rather because they’ve lost sight of it. But I maintain that this loosy-goosy “emergent” church stuff ain’t the answer either. OK, Steve, that’s cool. But I hope you will try to ignore the gossip about these ’emergent’ people and just listen to what they are saying (and see what they are doing) in context before you finalize your opinion. As we’ve seen here, by talking things out we may find out that we are not that far off in principle.